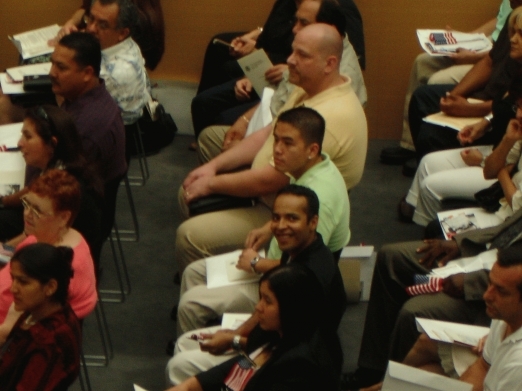 On Friday, I got my citizenship. Michael and I barely made it there. We left at about 7:00 am. The ceremony didn’t start until 9:00 am. Once we got to downtown Phoenix, I realized that I didn’t have my wallet, which meant I had no ID whatsoever. So I drove (average speed between 100-110 mph) back home. Then Michael drove back to downtown Phoenix through rush-hour traffic. It was crazy. We made it with 15 minutes to spare. 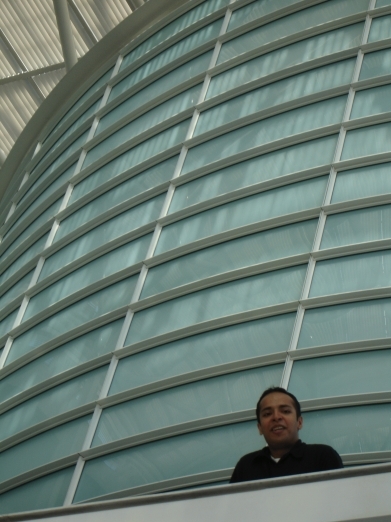 The ceremony was held in the Phoenix district courthouse, which is a pretty cool looking building. The ceremony didn’t actually start until 10:00 am. First they ask us to rise when the Judge walks in. 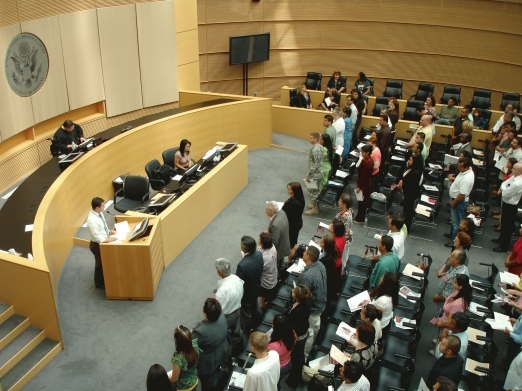 Then a motion to grant citizenship is presented to the Judge. He accepts. 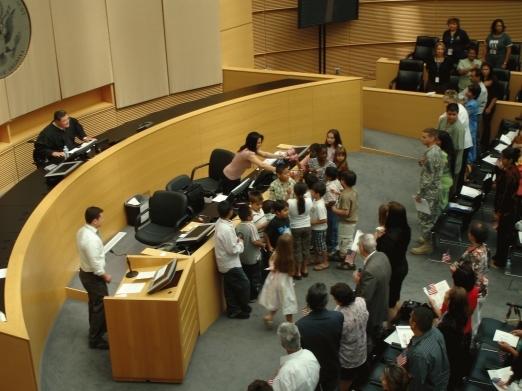 We raise our right hand to make the Oath of Allegiance (I already did this when I joined the military). 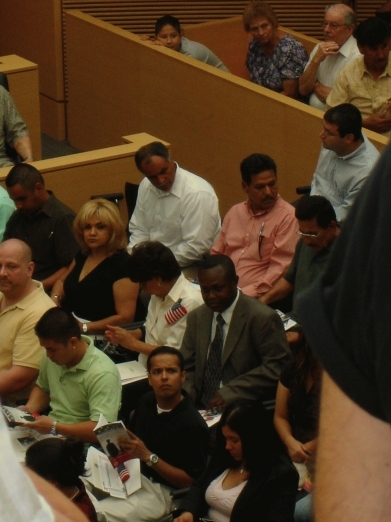 After that, he invited a few of the new citizens to come up and speak. There were a few touching stories, especially from this father who immigrated from Zimbabwe. He said he wanted his children to have a future (because of the current situation there), which is why he moved to the US. The ceremony was over by about 12:30 pm. 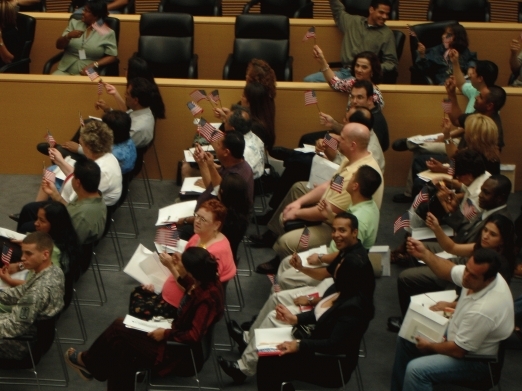 I got a certificate which told me that I was now a citizen of the United States of America. To tell you the truth, I didn’t feel that different. It was more of a formality than anything else. After all, I did go to war. I have some pictures from the ceremony, but I haven’t downloaded them from my camera yet. I’ll put them up here later today. 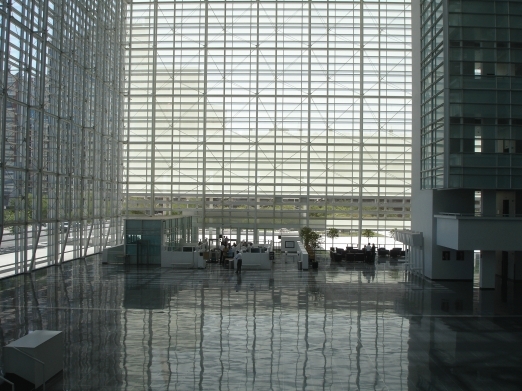 This is what the inside of the Phoenix district courthouse looks like. 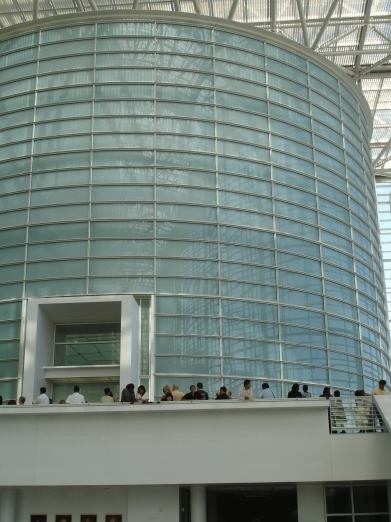 You can’t get the complete scale of the place until you’re inside. This is facing away from the courtroom, towards the outside. 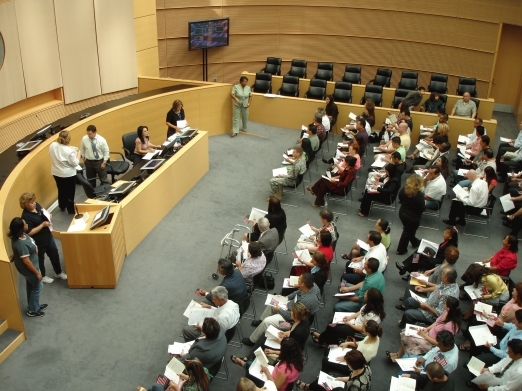 The courtroom is a cylindrical structure towards the end of the building. 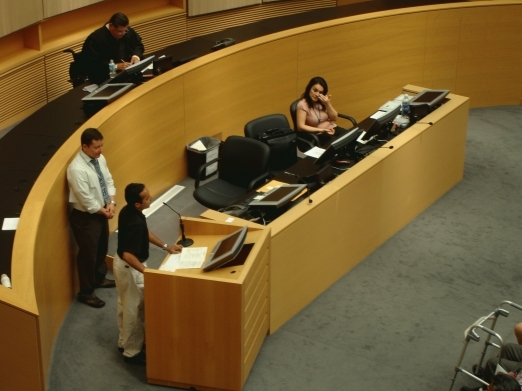 That’s me standing by the courtroom. 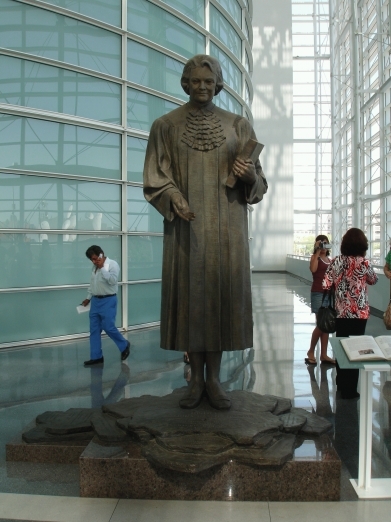 Statue of Sandra Day O’Connor. Taking the pledge of allegiance, led by a bunch of kids. That’s me speaking about how great it is to be a citizen. The speech is up there with all the other awesome speeches, like the ones by Lincoln, Churchill, Nehru, and King. In fact, can you see how the lady in the pink is wiping tears from her eyes? That’s how awesome I was. Either that or she is like “AHHH MY EYES ARE BURNING!”. They asked us to wave the flag while singing “I’m proud to be an American”. I felt it was a little cheesy. I mean, come on. I already went to Iraq and I was carrying guns and stuff there. I wear the American flag on my uniform. I didn’t feel like waving it while singing. Maybe if we had to just wave it, it would have been fine. But here I am waving it anyway, with a goofy grin on my face. Yeah but I got it for free hahahaha! Oh wait, I did go to war. Yaaay congratulations! I got mine the day after I turned 14 and apparently you have to read the oath when you turn 14 so there I was…this scrawny little 14 year old talking about how I would fight for my country. 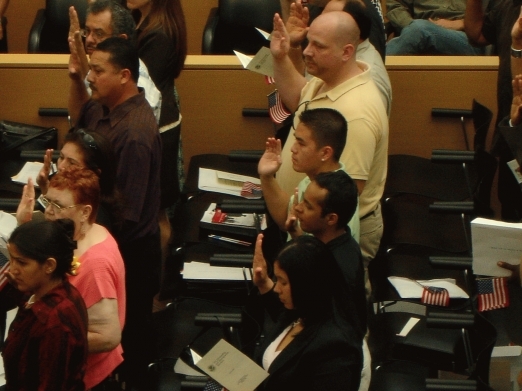 I remember facing a wall while reading the oath. Your experience sounds more exciting. At least you didn’t have to read to a wall.